Fall Risks of Older Adults : Farrow & Pulice, P.A. Walgreens is among the companies working to reduce the risk of fall accidents among seniors. Eligible seniors who ask about fall prevention can receive bonus points and purchase discounts. Fall accidents remain the leading cause of death for seniors over the age of 65, according to the Centers for Disease Control and Prevention. Bradenton injury lawyers understand seniors often never regain quality of life after a fall injury. One in five falls results in broken bones or serious head injuries, according to the CDC. Nearly 3 million older adults are treated each year in hospital emergency rooms for injuries sustained in fall accidents. More than 300,000 suffer broken hips. Broken hands, arms, wrists and ankles are other common injuries. Seniors are at higher risk of falls, higher risk of serious injuries, and higher risk of complications during recovery. Too often, a senior suffers reduced mobility and independence. Even in cases where injuries are not serious, fear of falling may reduce a senior's mobility. Conditions likely to result in falls include lower-body weakness, difficulties with walking or balance, vision problems, and use of certain medications, including sedatives, antidepressants and even over-the-counter medications. In fact, the side effects of some medications, and interactions between medications, are an often overlooked risk factor when it comes to senior fall accidents. The National Institutes of Health reports one-third of senior adults suffer a fall accident at least once a year. About half of those will fall at least twice. But the risks are even higher in nursing homes and senior-living facilities, where as many as half of all residents suffer a fall accident each year. This is particularly egregious when you consider most seniors are placed in professional care facilities to avoid such injuries. 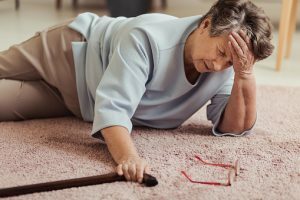 A Bradenton injury lawyer who handles fall accidents should have significant experience handling nursing home neglect and abuse cases, as well as premises liability and medical malpractice litigation. In general, businesses owe a higher duty of care to visitors and guests than do owners of private property. Those who cater specifically to seniors should take additional steps to make sure fall hazards are minimized, including added hand rails, adequate lighting, and maintaining walking surfaces free of hazards. State law, F.S. 768.0755, governs premises liability cases involving foreign substances on the floors of business establishments. Unfortunately, Florida lawmakers have worked to make it more difficult for injury victims to collect after accidents caused by wet or slippery floors. However, a claim may still be made in cases where a business had actual or constructive knowledge of a dangerous condition and failed to clean it up. Constructive knowledge may be proven by showing that the dangerous condition existed for a period of time sufficient for a business using ordinary care to have discovered and remedied it. Constructive knowledge may also be proven in cases where a dangerous condition occurred with regularity (such as from a leaking roof) and was therefore foreseeable. Choosing an attorney with significant experience in litigating fall accidents will put injury victims in the best position to make appropriate recovery.